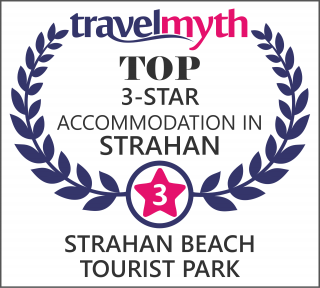 Strahan Beach Tourist Park will not be liable for any loss or damage of property. The tariff is based on the number of guests for the specified time and duration. Any changes to the booking may change the tariff. Prices quoted are current at time of booking, inclusive of GST and firm upon full payment for the specified time and duration. Where bookings that are canceled less than 14 days prior to arrival, an amount equaling 25% of the total accommodation quoted above will be retained (or one night's accommodation whichever is greater). Bookings can be moved, however prices may change depending on the new booking period and amendment fees may apply. Customers may hold credit on their client account for up to 12 months. The same cancelation requirements as indicated above apply to Group bookings (two or more on-site accommodation), however 30 days' notice must be given in this case. Within 48 hours of your due arrival date or in case of a no show the total amount of the accommodation may be retained. No refunds are given for early departures or cancelations once arrived. Only one promotional offer can be redeemed on any booking. Promotional codes or vouchers must be redeemed at time of booking. Discounts will not be applied or refunded after a booking has been confirmed. Strahan Beach Tourist Park reserve the right to refuse entry into the Park. Children must be supervised at all times. Care must be taken at all times to avoid injury in the playground area. Strahan Beach Tourist Park will not be responsible for any injuries sustained. Pets are not permitted in cabins. Animals must be restrained and contained at all times. Owners are responsible and liable for any damage or harm caused by pets.